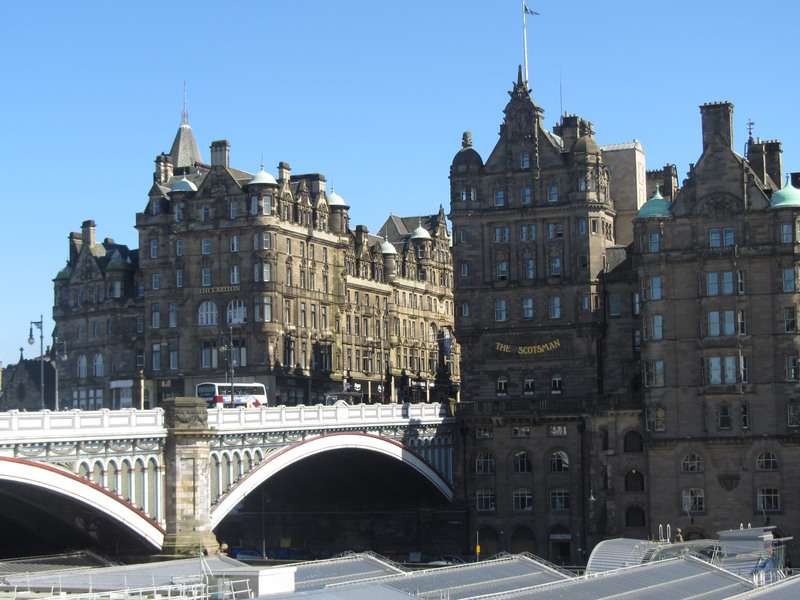 North Bridge in Edinburgh lies between Princes Street and the High Street. The original stone bridge was built on the site in 1763 to connect the old town with the new town across a marshy ravine. Six years later, after part of the bridge collapsed due to flaws in the design, and resulting in the deaths of 5 people, it was rebuilt and reopened in 1772. That bridge was again replaced in 1897 with the bridge that stands there today. 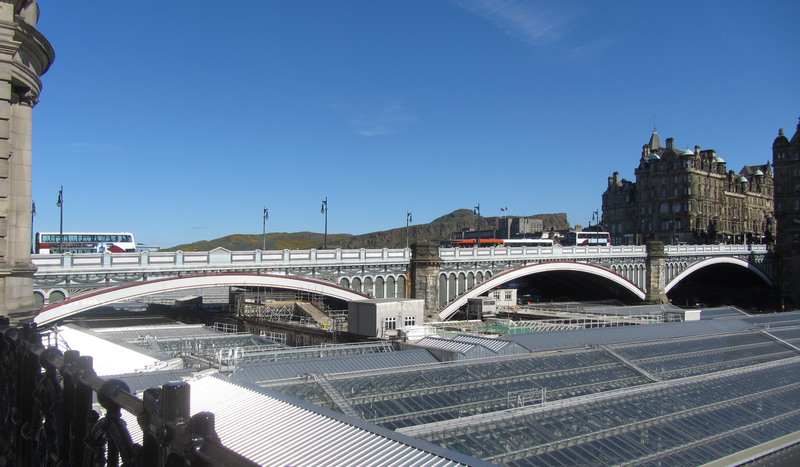 The new North Bridge was built by the Corporation of Edinburgh at a cost of £90,000, of which the North British Railway Company contributed a third, as part of their plans to redevelop the Waverley Station site to cope with the massive expansion of railway traffic. The new North Bridge was engineered by Blythe and Westland and the contractor was Sir William Arrol. Work began on the bridge in 1894 and it was built in 2 stages with the first half being completed in 1896. After that the old bridge was demolished and then the second half of the new bridge completed in 1897. The new bridge was 22.9m wide in comparison to the 16.5m wide bridge it replaced. It is 171m long, and constructed of three spans of iron girders resting on stone piers and abutments. Each span is 53.3m long, formed of 6 arched iron ribs which were built at Sir William Arrol & Co. Ltd in Glasgow. 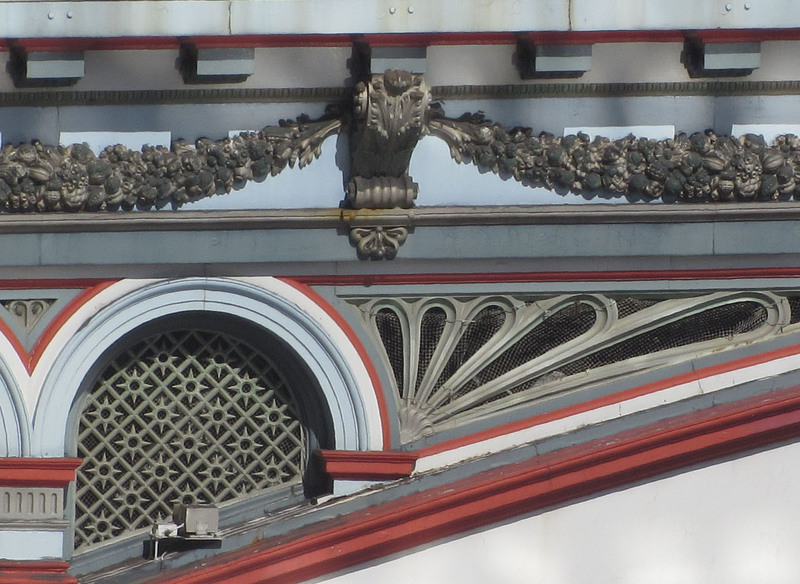 With architectural details designed by Robert Morham, the bridge is decorated with cast-iron facades and festoon work which is repeated in the masonry work of the stone pillars. During the 1990s major restoration work was carried out on the bridge, including the replacement of cast iron parapets, panels and columns which had deteriorated over the previous 93 years. It was opened on 1 September 1897 by Lord Provost Sir Andrew McDonald who said that during the 16 months since they had laid the foundation stone the work of rebuilding had gone on and they regretted the inconvenience that had been unavoidably caused to the public, tramway company, and the shopkeepers. They would now see what a great improvement and immense benefit the new bridge would prove, especially with the widening of the road. 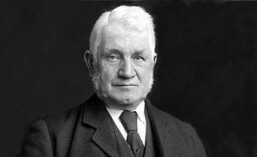 During the luncheon speeches after the opening ceremony Sir William Arrol said that the rebuilding for the bridge had been a very pleasant undertaking and that he had never taken part in any work that had gone more harmoniously than this, for engineers and builders alike, worked to have it completed at the earliest possible moment. On either side of the bridge are two plaques, one to commemorate the laying of the foundation stone and opening of the bridge, the other to commemorate the old North Bridge. There is a stone sculpture by William Birnie Rhind, a memorial to the soldiers of the King’s Own Scottish Borderers killed in the campaigns between 1878 and 1902. Looking along the bridge towards towards Princes Street, on the left lies the Balmoral Hotel, originally the North British Hotel which was completed in 1902 as a hotel to service Waverley Station and a Head Office for the North British Railway Company. On the right lies an an office building but this originally housed the General Post Office for Edinburgh. Looking in the other direction, towards the Royal Mile, on the right lies the Scotsman Hotel, previously headquarters of the Scotsman newspaper. The Scotsman steps, adjacent to the entrance of the hotel, is an octagonal tower of 104 steps which lead down to East Market Street below. These were renovated in 2013. On the right lies the Carlton Hotel with shops below, originally this was Patrick Thomson’s Department Store. The bridge offers splendid views of Calton Hill and Arthur’s Seat to the east, and of Edinburgh Castle and Princes Street Gardens to the west, with Waverly Station below.